This affordable hotel in Krasnodar, located next to the Gallery Krasnodar shopping mall, is convenient for guests who wish to stay in the city center. 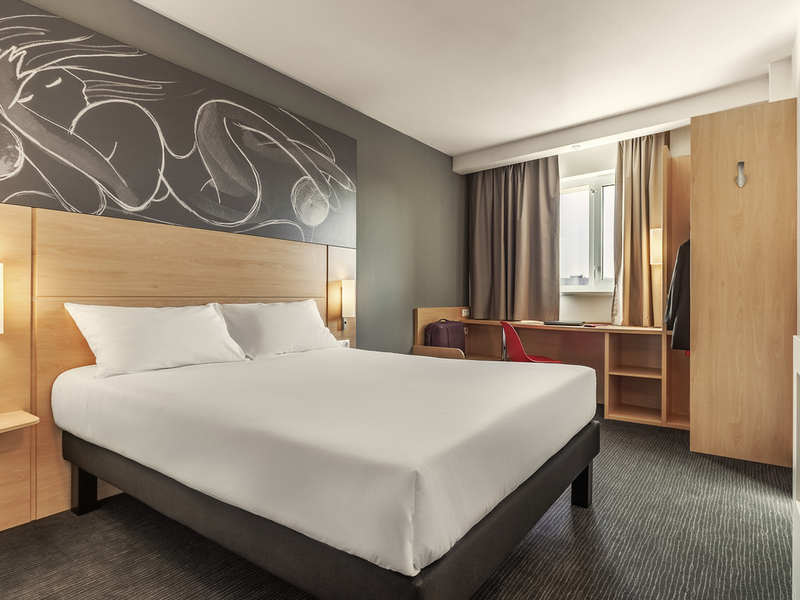 The hotel offers 220 modern rooms, the ibis Kitchen restaurant and bar, a business corner and spacious m eeting facilities. Each room is furnished with the very latest orthopedic Sweet Bed, which has been developed specially for ibis. With delicious meals served from a varied menu, excellent service and modern interior design, our ibis Kitchen restaurant is sure to impress. A varied selection of drinks and snacks with a stunning view over the streets of Krasnodar. All was great as it usually happens in ibis hotels. Friendly staff, clean room, comfortable bed and very good breakfast. I'm fully satisfied with hotel place and convenience. It meets my needs while business trip. I'm staying in this hotel for the 3rd time and all the time it's quite OK for me for my period of business trip to Krasnodar. We liked the hotel for good location, comfort and level of services you always expect from IBIS. Staff was very nice and friendly. Breakfast was also very nice. Went for business trip, need a confortable, no issue night... perfect. Great location- the very center of the city. Very pleasant and polite service. The room was small but very comfortable. The only problem was poor air conditioning- could be not pleasant on hot summer days. The highs and lows sums up the whole experience. Some of it very good - the breakfast was excellent, with a large variety of food and drink available, the room was clean, the staff friendly and welcoming. Some not so good, the worst point being the very soft bed which gave the impression of sleeping in a hammock with feet and head high and back bent down low. Both my wife and I had trouble sleeping and had painful backs as a result. The air conditioning never did get down to the desired temperature either resulting in a hot and stuffy night. Completely unexpected stay and service quality. Had to cut short the trip. You have your own rules and unfortunately we did not liked them. If someone doing good in business without competitive edge, it simply means that competitors are not doing as good. No drinking water in the room. No glasses in the room. Breakfast is poor. Hotel is looks more like bed'n'breakfast then 3 stars hotel. Everything was very good. I liked hotel much. As usual at Ibis. Everything is ok except poor breakfast. I wrote my review in Trip advisor. In short - advice to management: please, change the offer you make in your home page for Ibis Krasnodar. You are offering double room for parents with one kid under 12 years. In reality it means that children under 6 years are getting their own bed, but from 6-12 years old have to sleep with parents in the same bed (however, in reservation it says &quot; in the same room&quot; ) - at least, that was offered by your personell. We are family of 5 - 2 adults and 3 children (13, 13 and 8 years). We booked 2 rooms in Ibis Krasnodar (1 double and 1 double where child under 12 years sleeps with parents in the same room). Well, it turns out that in Ibis it means that child sleeps with parents in the same BED, however if child is under 6 years old, the he/she can get own bed, but from 6-12 y.o. should sleep in the same bed with parents (that was the offer from receptionist). Of, course, we were not happy with this solution, since the double bed is also not so big for 3 to fit in. Then "the party started" - we felt that they are trying to make fools out of us looking for any kind of statements, instructions, wordings to just get rid of us. Even offering to BUY another room. At the end, I asked for extra blankets and put my kid on the floor. I was fun for him:) When we came back to the room, we saw hotel' s statement for " 15 minute satisfaction guarantee" that made us laugh and not in the good way, since it was not used in our case... So, please, dear management of Accor hotels, change your offer in home page for Ibis Krasnodar to not make your customers and employees feel stupid fulfilling promises that you are making... And give your employees power to make decisions based on current situation, not just follow instructions that cannot cover all possible life situations! great location, great rooms, wonderful city, I'am loving it! Everything was very convenient, all is fine, close to the Krasnaya Str. and all major attractions. Services are at a high level, rooms are beautiful. Unfortunately, there are no fridge in a room. Proper air-conditioning system. Dear Guest! Thank you for your incredibly good review! We are delighted that you chose ibis for your stay in Krasnodar! We are so glad that you had such a lovely time at the hotel and felt well taken care of. It is wonderful to hear that you enjoyed the service and our great city center location. We appreciate your feedback and look forward to your future visits!